As the age old saying goes, “Trucking is in the blood”, but what does it mean? Is it because someone feels that trucking is what they love to do, or is it because they have a long line of truckers in their family? As a third generation truck driver and someone with a passion for being behind the wheel, Tonya Autrey has trucking in her blood for both reasons. Tonya obtained her CDL earlier this year, but is not new to trucking. “My father and grandfather both drove trucks for a living. It is what I grew up around and it sparked my curiosity as a child. 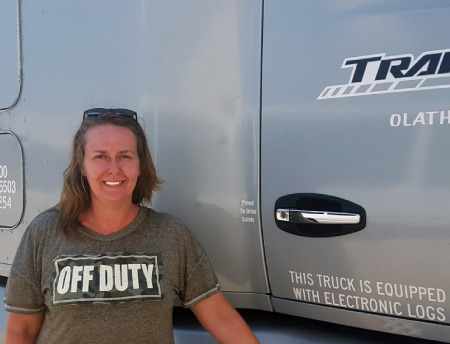 When the opportunity came for me to get my CDL, I knew I had to give it a shot.” Tonya joined TransAm as a company driver this past May and has already proven to be a valuable team member. “I enjoy working with Tonya and her being part of my fleet. She is always very pleasant no matter what is asked of her,” says Erin, her Driver Manager. Even though Tonya has only been behind the wheel for a short amount of time, she knows that trucking is in her blood. She is passionate and has proven to be a great driver already. We are thankful to have individuals like Tonya as a part of the TransAm team and are glad to be a part of her journey too. Thank you Tonya for everything you do!